A map is a visual representation of an area—a symbolic depiction highlighting relationships between elements of that space such as objects, regions, and themes. Many maps are static two-dimensional, geometrically accurate representations of three-dimensional space, while others are dynamic or interactive, even three-dimensional. Although most commonly used to depict geography, maps may represent any space, real or imagined, without regard to context or scale; e.g., Brain mapping, Gene mapping, and extraterrestrial mapping. Because maps are made for certain purposes, maps reflect certain scientific, practical, and political perspectives of the map maker. A world map, for example, reflects a certain political perspective by choosing to depict certain national boundaries and names of places, which imply the recognition of those independent nations. A celestial map from the seventeenth century, by the Dutch cartographer Frederik de Wit. Cartography, or map-making is the study and, often, practice, of crafting representations of the Earth upon a flat surface (see History of cartography), and one who makes maps is called a cartographer. Road maps are perhaps the most widely used maps today, and form a subset of navigational maps, which also include aeronautical and nautical charts, railroad network maps, and hiking and bicycling maps. In terms of quantity, the largest number of drawn map sheets is probably made up by local surveys, carried out by municipalities, utilities, tax assessors, emergency services providers, and other local agencies. Many national surveying projects have been carried out by the military, such as the British Ordnance Survey (now a civilian government agency internationally renowned for its comprehensively detailed work). A map can also be any document giving information as to where or what something is. 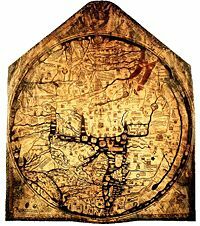 The Hereford Mappa Mundi, circa 1300, Hereford Cathedral, England. A classic "T-O" map with Jerusalem at centre, east toward the top, Europe the bottom left and Africa on the right. Reversed maps, also known as Upside-Down maps or South-Up maps, which generally show Australia and New Zealand at the top of the map instead of the bottom. Polar maps of the Arctic or Antarctic regions are conventionally centred on the pole, in which case the direction north would be towards or away from the centre of the map, respectively. Buckminster Fuller's Dymaxion maps are based on a projection of the Earth's sphere onto an icosahedron. The resulting triangular pieces may be arranged in any order or orientation. Maps from non-Western traditions are oriented a variety of ways. Old maps of Edo show the Japanese imperial palace as the "top," but also at the center, of the map. Labels on the map are oriented in such a way that you cannot read them properly unless you put the imperial palace above your head. Medieval European T and O maps such as the Hereford Mappa Mundi were centered on Jerusalem with east at the top. Indeed, prior to the reintroduction of Ptolemy's Geography to Europe around 1400, there was no single convention in the West. Portolan charts, for example, are oriented to the shores they describe. Sea route and channel maps have traditionally been oriented to the road or waterway they describe, such as the controversial navigational maps showing the New World, by Zheng He. Many maps used in the Society for Creative Anachronism show the west at the top, in honor of the Society starting in California. Many but not all maps are drawn to a scale, expressed as a ratio such as 1:10,000, meaning that 1 of any unit of measurement on the map corresponds to 10,000 of that same unit in reality. This allows the reader to estimate the sizes of, and distances between, depicted objects. A larger scale (i.e., the second number of the ratio is smaller) shows more detail and supports more accurate estimates, thus requiring a larger map to show the same area. 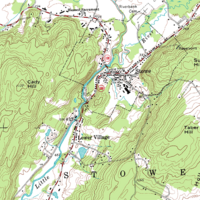 Highly detailed maps covering areas ranging upward in size from small cities or counties to entire countries or continents are now often published as books, or computer software (with numerous tools to aid the user, including user-adjustable scale and customized search engines), for convenient handling. Printed versions may include a comprehensive index, tables of distances between cities, and possibly even a cross reference of important destinations. Computer software based maps provide numerous tools to aid the user, including user-adjustable scale (a.k.a "zoom") and customized search engines to locate street addresses. Historically, large maps were presented (but not necessarily published, due to prohibitive labor costs) as scrolls, a famous example of which is the recently rediscovered hand-made copy of the Tabula Peutingeriana showing Roman roads from Spain to India..
For modern examples, published maps designed for the hiker (e.g., USGS Topographic maps, also called "Topos") are often scaled at the ratio of approximately 1:25,000, while maps designed for the motorist to display major highways might be scaled at 1:250,000 or 1:1,000,000. In any case, a properly made map will either state its scale, or declare that it is not scaled and can not be reliably used to deduce distances. Cartogram: The EU distorted to show population distributions. Maps which use some quality other than physical area to determine relative size are called cartograms. An (non-cartogram) example of a map without scale is a subway map, which best fulfills its purpose by being less physically accurate and more visually communicative to the hurried glance of the commuter. This is not a cartogram (since there is no consistent measure of distance) but a topological map that also depicts approximate bearings. The simple maps shown on some directional road signs are further examples of this kind. In fact, most commercial navigational maps, such as road maps and town plans, sacrifice an amount of accuracy in scale to deliver a greater visual usefulness to its user, for example by exaggerating the width of roads. With the end-user similarly in mind, cartographers will censor the content of the space depicted by a map in order to provide a useful tool for that user. For example, a road map may or may not show railroads, smaller waterways or other prominent non-road objects, and if it does, it may show them less clearly (e.g., dashed or dotted lines/outlines of various colors) than highways. Known as decluttering, the practice makes the subject matter the user is interested in easier to read, usually without sacrificing measurement accuracy. Software-based maps often allow the user to toggle decluttering between ON, OFF and AUTO as needed. In AUTO the degree of decluttering is adjusted as the user changes the scale being displayed. Topographic maps, show elevation above (or depression below) sea level as contour lines, a specific type of Isoline. Isolines on any map or chart indicate the constant labeled value, such as elevation, temperature, or rainfall, for that particular line. Depending on the type of a map, alternative representations of elevation (or depression) exist as well. Maps of the world or large areas are often either 'political' or 'physical'. The most important purpose of the political map is to show territorial borders; the purpose of the physical is to show features of geography such as mountains, soil type or land use. Geological maps show not only the physical surface, but characteristics of the underlying rock, fault lines, and subsurface structures. 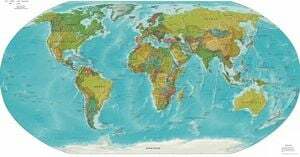 Maps that depict the surface of the Earth also use a projection, a way of translating the three-dimensional real surface of the geoid to a two-dimensional picture. Perhaps the best-known world-map projection is the Mercator Projection, originally designed as a form of nautical chart. Airplane pilots use aeronautical charts based on a Lambert conformal conic projection, in which a cone is laid over the section of the earth to be mapped. The cone intersects the sphere (the earth) at one or two parallels which are chosen as standard lines. This allows the pilots to plot a great-circle route approximation on a flat, two-dimensional chart. Azimuthal or Gnomonic map projections are often used in planning air routes due to their ability to represent great circles as straight lines. Reginald Buckminster Fuller patented one such Gnomonic projection in 1946 as the Dymaxion Map. Richard Edes Harrison produced a striking series of maps during and after World War II for Fortune magazine. These used "bird's eye" projections to emphasize globally strategic "fronts" in the air age, pointing out proximities and barriers not apparent on a conventional rectangular projection of the world. A USGS digital raster graphic. From the last quarter of the twentieth century, the indispensable tool of the cartographer has been the computer. Much of cartography, especially at the data-gathering survey level, has been subsumed by Geographic Information Systems (GIS). The functionality of maps has been greatly advanced by technology simplifying the superimposition of spatially located variables onto existing geographical maps. Having local information such as rainfall level, distribution of wildlife, or demographic data integrated within the map allows more efficient analysis and better decision making. In the pre-electronic age such superimposition of data led Dr. John Snow to discover the cause of cholera. Today, it is used by agencies as diverse as wildlife conservationists and militaries around the world. Even when GIS is not involved, most cartographers now use a variety of computer graphics programs to generate new maps. enlarging the same map with the pixels enlarged (replaced by rectangles of pixels); no additional detail is shown, but, depending on the quality of one's vision, possibly more detail can be seen; if a computer display does not show adjacent pixels really separate, but overlapping instead (this does not apply for an LCD, but may apply for a cathode ray tube), then replacing a pixel by a rectangle of pixels does show more detail. A variation of this method is interpolation. Typically (2) applies to a Portable Document Format (PDF) file or other format based on vector graphics. The increase in detail is, of course, limited to the information contained in the file: enlargement of a curve may eventually result in a series of standard geometric figures such as straight lines, arcs of circles or splines. (2) may apply to text and (3) to the outline of a map feature such as a forest or building. (1) may apply to the text (displaying labels for more features), while (2) applies to the rest of the image. Text is not necessarily enlarged when zooming in. Similarly, a road represented by a double line may or may not become wider when one zooms in. The map may also have layers which are partly raster graphics and partly vector graphics. For a single raster graphics image (2) applies until the pixels in the image file correspond to the pixels of the display, thereafter (3) applies. See also Webpage (Graphics), PDF (Layers), Mapquest, Google Maps, Google Earth or Yahoo! Maps. To communicate spatial information effectively, features such as rivers, lakes, and cities need to be labeled. Over centuries cartographers have developed the art of placing names on even the densest of maps. Text placement or name placement can get mathematically very complex as the number of labels and map density increases. Therefore, text placement is time-consuming and labor-intensive, so cartographers and GIS users have developed automatic label placement to ease this process. Brain mapping is a set of neuroscience techniques predicated on the mapping of (biological) quantities or properties onto spatial representations of the (human or non-human) brain resulting in maps. All neuroimaging can be considered part of brain mapping. Brain mapping can be conceived as a higher form of neuroimaging, producing brain images supplemented by the result of additional (imaging or non-imaging) data processing or analysis, such as maps projecting (measures of) behaviour onto brain regions (see fMRI). Brain mapping techniques are constantly evolving, and rely on the development and refinement of image acquisition, representation, analysis, visualization and interpretation techniques. Functional and structural neuroimaging are at the core of the mapping aspect of Brain mapping. Gene mapping or genome mapping is the creation of a genetic map assigning DNA fragments to chromosomes. When a genome is first investigated, this map is nonexistent. The map improves with the scientific progress and is perfect when the genomic DNA sequencing of the species has been completed. During this process, and for the investigation of differences in strain, the fragments are identified by small tags. These may be genetic markers (PCR products) or the unique sequence-dependent pattern of DNA-cutting enzymes. The ordering is derived from genetic observations (recombinant frequency) for these markers or in the second case from a computational integration of the fingerprinting data. The term "mapping" is used in two different but related contexts. Two different ways of mapping are distinguished. Genetic mapping uses classical genetic techniques (e.g. pedigree analysis or breeding experiments) to determine sequence features within a genome. The use of modern molecular biology techniques for the same purpose is usually referred to as physical mapping. A map in planetary cartography is a generalized image of the surface of an extraterrestrial solid body (excluding the Earth), that indicates the location of objects projected mathematically according to the adopted coordinate system used for the projection. Symbols can represent any subject, phenomena or process chosen by the cartographer to be illustrated on the map (a legend defining all symbols should be included to aid the map user). Maps of extraterrestrial territories represent all solar system bodies, with the exception of the Earth; they can be portrayed in a variety of forms, such as electronic (e.g., digital), conventional (printed), multilingual, orthophoto, drawing (e.g., shaded relief), outline, topographic (contoured), and thematic. ↑ Bethany Bell. Ancient Roman road map unveiled, BBC News, Monday, 26 November 2007, 19:23 GMT. Retrieved June 20, 2008. ↑ .Library of Congress. Retrieved July 6, 2008. ↑ E. Imhof, “Die Anordnung der Namen in der Karte,” Annuaire International de Cartographie II, (Zürich: Orell-Füssli Verlag, 1962), 93-129. Ahn, J. and Freeman, H., “A program for automatic name placement,” Proc. AUTO-CARTO 6, Ottawa: 1983. 444-455. Bell, Bethany. Ancient Roman road map unveiled, BBC News, Monday, 26 November 2007, 19:23 GMT. Retrieved June 20, 2008. Freeman, H., “Computer Name Placement,” ch. 29, in Geographical Information Systems, 1, D.J. Maguire, M.F. Goodchild, and D.W. Rhind, New York: John Wiley, 1991. 449-460. Freeman, H., "Map data processing and the annotation problem," in Scandinavian conference on image analysis, Peter W. Becker, and Peter Johansen. Proceedings of the Third Scandinavian Conference on Image Analysis: Copenhagen, Denmark, July 12-14, 1983. Lund: Studentlitt, 1983. Freeman, Herbert, Automated Cartographic Text Placement. White paper. maptext.com. Retrieved June 20, 2008. Imhof, E., “Die Anordnung der Namen in der Karte,” Annuaire International de Cartographie II, Zürich: Orell-Füssli Verlag, 1962, 93-129. O'Connor, J.J. and E.F. Robertson, The History of Cartography. Scotland: St. Andrews University, 2002. Retrieved June 20, 2008. All links retrieved September 16, 2014. This page was last modified on 10 August 2018, at 18:50.